USS Constitution at the Charlestown Navy Yard. (U.S. Navy photo by Mass Communication Specialist 3rd Class John P. Benson). USS Constitution is berthed at the Charlestown Navy Yard in Boston harbor. Not far from the Bunker Hill Monument, it lies at one end of Boston's Freedom trail. The Constitution is an active Navy ship. Except when it is undergoing a refit, Constitution is in the water. Each year, the ship is taken out into Boston harbor for a short cruise and then docked facing in the opposite direction to that she was facing when she left. This is done so that the ship will weather evenly on both sides. As a commissioned Navy ship, Constitution is manned by officers and sailors who are active duty U.S. Navy. It is considered a special duty and those who serve on the ship are selected because of their exceptional merit and ability to convey the spirit of the Navy to the public. In addition to maintaining the ship and sailing her when she goes to sea, the sailors give public tours of the ship and are available to answer questions about the ship. The tours are free of charge. Visitors can tour Constitution’s top three decks (spar, gun and berth). Spar deck is the topmost deck and is open to the weather. The most memorable image here is the ship's three towering masts laced together by a web of rigging. They form a visually stunning elegant design. However, when you recall that they are what powered the ship and that in order to change speed or maneuver, men had to climb into the rigging - - regardless of the weather or sea conditions -- the experience becomes even more astounding. 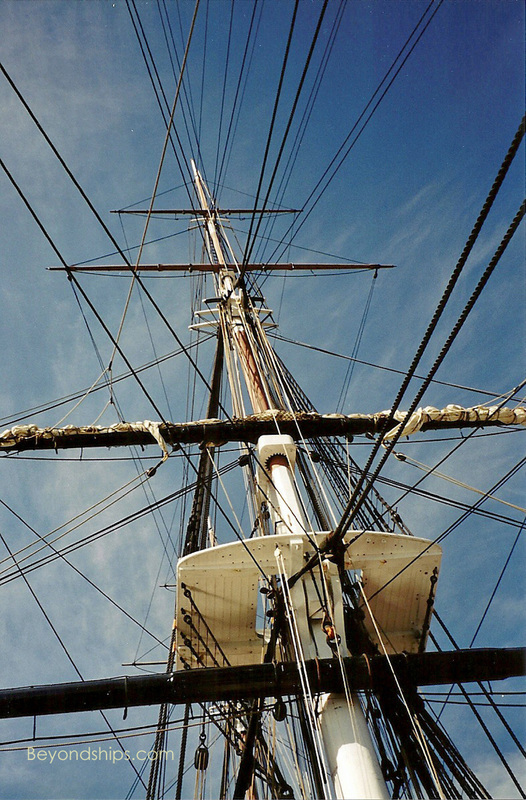 Above: Looking up at Constitution's rigging. Below: Looking down from the foremast at Spar Deck U.S. Navy photo by Mass Communication Specialist 3rd Class Victoria Kinney). Although Constitution was rated as a 44-gun frigate, she often carried more than 50 cannons. While she had some guns on her open deck, the main battery was below on Gun Deck. Here, she had at least 16 24-pounder cannons on either side. During battle, this smoke-filled area would be a hive of activity with teams of nine men and boys swabbing down, loading, aiming and firing each gun. At other times, the men would live and eat by the guns. They would get fresh water from the scuttlebutt and 190 proof grog from a barrel guarded by a marine sentry. Also on this deck, the ship's cook would prepare meals for the 450 to 500 sailors aboard on a large black stove. Here too is the capstan used for raising and lowering the anchor. To turn the capstan, the sailors would push against wooden handles as they walked around it. Often a fiddler would play to give the men a tempo. Still, what is particularly impressive here is the size of the guns and how they dominate the area. Each weighs some 6,500 pounds. While they could hurl a 24 pound cannon ball 1,200 yards, most naval battles of this era were fought with the ships less than 50 yards apart. The impact of these projectiles at such close range must have been terrifying. One deck below is the Berth Deck where the sailors slept. This area has no natural light and little headroom. It was only big enough for about half the crew so while one half slept in their hammocks, the others were working elsewhere. Separated by a curtain immediately forward of the sailors' sleeping area was the sick bay, where the sick and wounded received what medical care was available in the early 19th century. Immediately aft of the sailors, was the berthing area for the ship's contingent of Marines. Aft of them was the wardroom and the closet-like living quarters occupied by the ship's officers. The captain, of course, had much larger quarters. These were at the aft end of Gun Deck and ran across the stern of the ship. 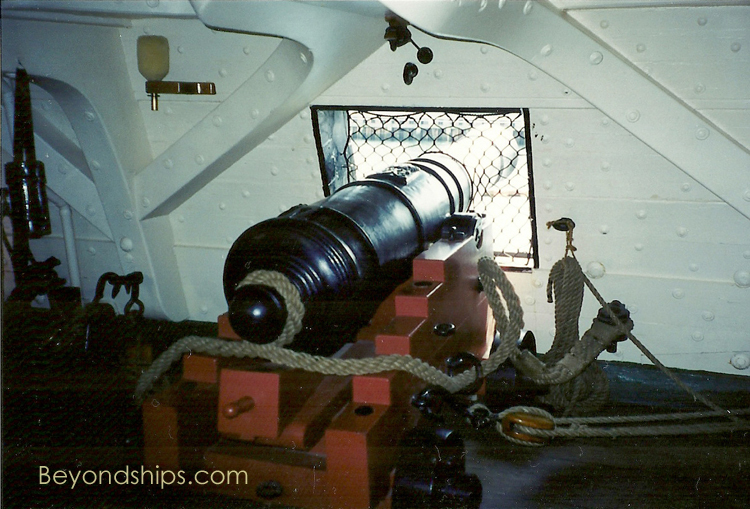 In battle, the captain's quarters would be torn down so that the crew could work the four great cannons that made up part of the decor in his rooms. The tour does not go into the captain's quarters but you can see into it through the partition that separates it from the rest of Gun Deck. Returning to the open deck, the aft end is the Quarter Deck where the ship's wheel is located and from which the officers would command the ship. Here also is where the ship's flags were flown. The public can arrange to have their own U.S. flag flown over the Constitution. The Constitution is not the only attraction at the Charlestown Navy Yard. Only a few years younger than the Constitution, several of the historic Navy Yard buildings are open to view. In addition, the World War II era destroyer USS Cassin Young is berthed here. The National Parks Service operates these attractions and gives tours. Founded in 1976, the USS Constitution Museum began in the building that once housed the pumps for one of the Navy Yard's drydocks. It has exhibits and interactive displays about the Constitution and its career. Admission to the USS Constitution is free of charge and is done on a first come, first served basis. Visitors must have a state-issued driver's license or identification card. There is also a security check. Starting in March 2015, the Constitution will begin a three-year drydock refit during which the ship will not be open to the public.